In Part 2 of this series, "Sketching Unquiet", I wrote about what bipolar disorder is as a medical condition, and then I attempted to roughly approximate what it’s like to live with it on a daily basis. In the week and a half since publication I've re-read that installment of Being Bipolar at least a dozen times and the more that I do, the more I can't help but feel led to ponder and expound on it further. Now don't get me wrong: Part 2 was the best that I could have written... at that time. But the composition and publishing of "Sketching Uniquet" has not led cleanly to the Part 3 that I had originally planned. Instead it has been like God is showing me "Chris, you wrote about your understanding of this and doing so has helped you to understand it even better... so write that this time." See how this is working out, Dear Readers? 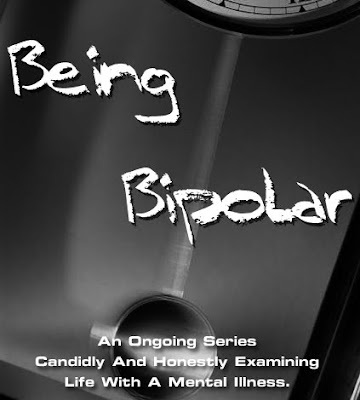 Being Bipolar is not a series of retrospective reflections about living with a mental illness. Indeed, there cannot POSSIBLY be any "retrospective" at all. That would imply that I have completely conquered this disease and that it will never, ever again be something that I will be fighting against. That it will merely be something that I can look back upon and feel some measure of gloating about "Hey, I licked this!" And that would be a lie. Because I am never going to completely lick this thing. Bipolar disorder has no cure. There is only a lifetime of controlling this as best I can this that I have to look forward to. And the more that I discover about my own condition the more I am learning how the struggle to manage bipolar disorder is as unavoidable as bipolar was at all. Bipolar disorder was a disease that I was going to be hit with. I can see that now. It was a condition that I was born with as much as some are born with hemophilia or congenital heart defect. The only way that I would have known a life without bipolar disorder is if God Himself had allowed me to be mercifully free of it. I've already written about how I have cried out to Him, especially during these past few months. What happened to precipitate that? Ironically it has been my own recovery from two years and more of the worst of bipolar that I have experienced (and Lord willing will always remain the worst that I have had to go through). Bipolar took away feeling from me. It took away sympathy and it took away empathy and it took away the capacity to fully love and feel remorse. As one good friend put it: I went through the past two years "numb" to most of the life around me. And then just before this past fall something finally "clicked" into the right place in my neurobiology and everything that I should have already been feeling on my conscience crashed down on me. There is a thorn in my mind, that I have cried out to God to deliver me from. And still, He won't do it. "My grace is sufficient," He has told me just as He told the apostle Paul that His grace was enough to let that great apostle endure life with the thorn in his flesh. I do wish that God had never let me have this. Because I have to believe that I would have never have had to lose friendships, opportunities, and my marriage. ...but there is plenty that I can choose to do about it now. So, I can never be cured of bipolar disorder. But I also believe that God has a purpose for everything, and that for those who love Him that even the trials and tribulations of this life... no matter how painful and bitter they may be to go through... He can and will use not only to make manifest His wonder and majesty, but also to deliver us to greater things than we could possibly imagine. The only "selfish" reason I have for doing Being Bipolar is because working on this series is helping me to explore and understand my own condition. Beyond that, I am doing this because I know what bipolar does to individuals and their loved ones... and I will do anything within my power and ability to spare others that unimaginably severe grief and suffering. And, I am doing this for God. Not because I feel like I "have" to, but because I want to. If He has allowed me to have this condition, then I absolutely and sincerely do want to use this to give all the honor and praise to my Lord and Savior. Isn't that what all of us who have chosen to follow Christ are meant to do, with the trials and tribulations in each of our lives? We serve and follow a living God. He is shown to be great in our weakness and frailties. If I am strong for doing this series, it is only because He has brought me through worse than fire and fear. And like every other trouble in life, this also is a means of growth and learning. So it is that I will never stop learning from being bipolar. And I'll never stop sharing what I am learning from it. And if I was always bound to have bipolar, well... I feel no small amount of gratitude that I am able to write about this. So in the past week since writing Part 2 a new model (well, new to me anyway) of what existence with bipolar disorder developed and coalesced together in my mind, and it immediately occurred to me that many people would find this of immensely more help toward understanding this disease than any amount of words that I could write with that goal in mind. Now, math ain't my strongest suit (in fact I had to get some advice from a way smarter person than I'll ever be in the realm of higher numerical operations) but regardless of that, I am going to put into graph form how most people experience mood and emotion. And then I'm going to present what it is like for a person with bipolar disorder. A nice, simple sine wave. You have ups and downs. Mountains and valleys. Peak moments of joy and thrill and rock-bottom periods of sadness and depression. But even when you have your "down" times, you almost certainly know to expect a rebound back up. And I am aware that real life isn't that clean and neat. That it would be really nice if our moods could be so perfectly rhythmic. 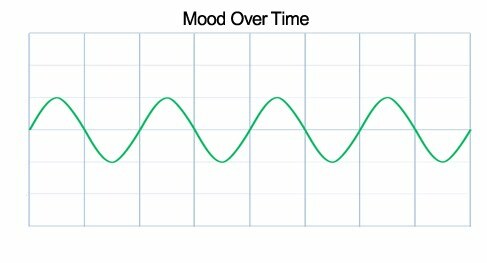 But that said, you gotta admit: that is a graph that suits the needs of visualizing normal moods. And going from left to right, that is your cycle (I hope) of mood through time. Keep that in mind. You, good reader, if you are so blessed, have a good ol' fashioned two dimensional representation of your moods. That graph is nothing like what a person with bipolar disorder can know on a routine basis. Oh sure, there can and thankfully are periods that I can have "ups and downs" like most people. And I am glad that at last those periods are becoming longer and longer as I learn how to better manage my condition. I wouldn't be able to document and chronicle my own personal journey with bipolar if I wasn't at last afforded that because of medication and counseling. But that isn't something that I dare believe that I have the luxury of finding complete rest from and letting down of my guard again. At the moment I am writing to you from what I call the "Productive Life Zone" (sounds like something out of Star Trek, doesn't it?). This is where most people spend their entire lives at, without ever knowing any different. That is where I wish that I could have spent my entire life at. But the best I can do is strive and work and pray that I can maintain a presence there, for however long I possibly can. Within that zone, that narrow band of sense and rational mind, I am completely as good a person as anyone is likely to be. The problem though is that as a person with bipolar disorder, I can not be perfectly secure in that zone. Because my own mind – if I cease to manage my condition - will begin to tear me apart between the wildest extremities of heightened mood and uttermost depression. Trust me: if I could I WOULD stay nestled and safe in that zone... and never have to endure the pain of being yanked violently between those two realms of wild emotion and agonizing darkness of mere being. THAT is a picture of bipolar disorder, ladies and gentlemen. THAT is where I and many, many others must live and contend with every day of our existence. And I am glad that I can know and appreciate this now. I wish that someone could have shown me this graph a long, long time ago. It might have saved me a lot of pain. It might have saved others in my life more pain than they should have ever had to go through. It is called the "Hell Curve" for a reason. Because if I can't maintain myself within that very slim margin of mental clarity, my life can, will and does become a living Hell. It turns into Hell for those that are closest to me and who I care about most. It is because I was incapable of abiding in that zone that I lost... well, darn nearly everything that I held precious. Knowing where I need to be, where I must persist in being, I can have a life as normal and wonderful as anyone. But I've got my work cut out for me. I can't see going without medication and counseling for as long as I live. But I know where I want to be. I know the life that I do still want. And that is worth doing what I can to stay "in the zone". Notice that the curve doesn't cycle up and down. On one side it soars and on the other it plummets. There is no upper and lower limit to the Hell Curve. If I were ever unable to stop – or for someone to help me stop – my mind from climbing in mood intensity, it would doubtless take me to a very dark place that would end... well, it would end bad. And if I were to slip into a state of bipolar depression that could not be abated, I would perhaps inevitably commit suicide. That is, if I didn't understand bipolar as well as I do now, because I do understand that this is part of the medical condition. It's not a part of the real me. But bipolar and suicide is something that I'm gonna go into further in an upcoming chapter of Being Bipolar. On the "normal" sine wave for most people, there is mood across time. I noted that it's two-dimensional for "regular" people, right? The Hell Curve adds in a Z-axis to the graph (remembering my eighth grade Pre-Algebra class, which I never failed to give poor Mr. Hill no small amount of frustration... but I'm glad that I get to acknowledge now that I did learn something useful from him after all :-). The Z-axis becomes time proceeding for the bipolar person, so that's then mood across three dimensions. I'm trying to keep within the Productive Life Zone while working to manage my bipolar across time. Doing what I can to keep my mind from deviating toward one mood pole or the other. And if I can stay within that zone, no matter how much time goes by, I know that I can and will have at long last the life that I have been unable to most fully enjoy until now. My being here has become a work of art in multiple dimensions, across a span of time and will continue developing and growing into what God would have it become, for the rest of my life. So in a way, having bipolar disorder has helped me come to appreciate how beautiful and precious life really is. I don't know if I could have come to the perspective that I have now, if I did not have this to overcome. And as one friend put it over the weekend: God never lets anyone be an overcomer if there is nothing to overcome to begin with. But back to the Hell Curve. Again, I wish that I had been given this model years ago. It shows not only bipolar disorder and what it means to struggle with it, but it also has much to illustrate about how this can be an extremely difficult illness to give medical treatment to and to bring it under control. The biggest example from my own life that I can think of was a time between late 2004 and around the middle of 2005. That was when I was working on my first film, Forcery. The one that spoofs Stephen King's Misery, but in our version it's George Lucas being held captive by an obsessed Star Wars fan. Forcery had been a personal dream of mine since getting the idea in 2001... even though I had no idea at all how to put a movie together. Well, come summer of 2004 I had a script, a camera, and I had a great cast, including my lifelong best friend Chad Austin (who I persuaded or conned or something into playing George Lucas... and he did a terrific job in the part!). There were fits and misfires... not to mention how I nearly burned down my parents' house with some real fire... but come late fall of 2004, I had all the footage that I needed to assemble Forcery. And then, my mind went from working at a hard creative high... to dropping like a stone without warning. It was as if as soon as the last bit of footage that we had shot was in the can, that I became totally drained. And not just of creative juice either: my mind rapidly and without any obvious reason became void and empty of all passion and desire. It was a severe episode of bipolar depression. But I didn't understand that at all at the time. Or at least, I didn't completely understand what that meant. I didn't know what it was doing to me. I struggled to find desire again. I struggled to find my energy and determination. Yeah, that is the word for it right there: my "determination". Where was it? To have that suddenly robbed from me was unendurable. Meanwhile the months were going by and creeping into 2005. I had set a goal for myself that Forcery would be finished in time for the premiere of Star Wars Episode III: Revenge of the Sith. Why? Not just 'cuz I thought it would be great publicity for my own film, but because I really did want there to be as much attention as possible, while the "iron was hot" so to speak, on the efforts of the film's cast. Chad Austin, I have known all my life. Melody Hallman Daniel, the amazing actress who played Frannie: well, she became a great friend too and I was seriously hoping and praying that Forcery might somehow propel her onto the big screen where her talents deserve to be. Anyway, back to the story. Time was against me. But my mind was against me even worse. It was like a thick heavy steel door in my brain, shutting me away from the DETERMINATION that I needed to tap into. But, I just couldn't get to it no matter how hard I tried to focus my mind on it. In early 2005 my psychiatrist prescribed a medication. We thought it would elevate me out of depression and get me to a point where I could be functioning and creative and able to work again. I was totally debilitated in mind and... well, we had to try something. The medication turned out to be a horrible, horrible mistake. 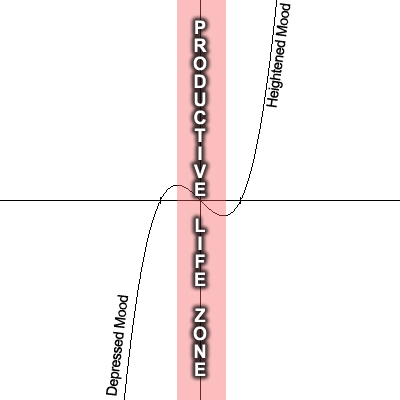 Did it take me out of the depressive leg of the Hell Curve and propel me toward the Productive Life Zone? Yeah. Yeah, it did that, most certainly. But the medication wouldn't STOP there either. My ability to compel myself with drive and desire went from a state of near-zero, and shot up like a rocket to a place that I never, ever want to be at again for as long as I live. I know of no other way to put it than this: the medication, which was supposed to work on one extreme end of my bipolar, drove me crazily toward the other end. The medication made me feel almost God-like. And that was very, very wrong and I even knew that it was wrong! But the sense of euphoria, the feeling that I could accomplish anything, was so intoxicating and overwhelming, that my mind couldn't or wouldn't make the connection to the drug that I was prescribed. You can't begin to imagine what a mind like the one I have turned into, when medication drove it into what I have come to call a state of rampancy. If I couldn't do anything because of bipolar depression, then accelerated bipolar thinking was even more hideous in its ability to incapacitate. Nothing became beyond my ability to take apart and comprehend. Look, I know what I'm talking about, because my mind did things... things that I wrote down even... during those few months, that I could NOT and WOULD NOT have ever done if the "real" me had been able to be at the controls. Somewhere in there I began to feel the desire to die. No, not in the "Goodbye cruel world" sense that I'm sure my words have just suggested. How do I put this? Okay: instead of being driven to wonder about suicide because of depression and the absence of feeling, now I was seriously wondering if dying might free me of the confines of flesh and allow me to become a creature of pure mind. Death wasn't a measure to escape an unendurable life. For longer than I have the heart to admit, death became something to consider pursuing to free me to exist in a whole 'nother and greater state. Delusions of god-hood? Or was I thinking that I was only trying to be what God wanted me to be, were it not for things like hunger for food and desire for intimacy holding me back? It was the most powerful that my mind has ever been. And looking back, I do realize that there was no delusion involved: my mind reached a place of comprehension and ability and understanding that... we aren't meant for. That none of us are meant for. That I certainly will never be ready for on this side of Heaven. It was the rarest of the rare air that has driven some of the greatest of geniuses and artists to madness even unto the bitter end. Two things kept me from destroying myself one way or another in that time. The first was Forcery, and knowing that I needed to finish it. That I should get it done for Chad and Melody, and for Ed, and for everyone else who helped me make that movie. And in each their own way, Chad and Melody and Ed helped me to keep it together not just for Forcery, but for long afterward. The second thing was my wife. Who I will never stop regretting the pain that I put her through and wishing that I could take it all back. I don't know if I will ever see her again, this ended up destroying our marriage so thoroughly. But, I have to thank her. She was always the best reason that I ever had to persevere. If it were not for her, I have no doubt that I would not be here at all to write about this. Well, it was too long before we understood that it was the medication that was driving my mind toward the other length of that cruel geometry. I went off of it in June of 2005. But by then I had become addicted to that particular medication. I'm still addicted to the drug, even though I haven't taken any in about six and a half years. Just as recovering alcoholics can't drink alcohol, so I also now have a well-developed relationship with this drug. It was many months of "coming down" and "detoxing" it from my system and my psyche... and it only served to add even more pain and confusion to what I was already going through because of the bipolar. Part of the summer of 2005 I felt great sadness and sorrow for what I had done. I cried a lot. My wife told me that she was proud of me for working through it. I want to believe that she would still be proud of me. I am always going to be grateful to God for the time we had. I am a much better person for her being in my life than if she had not. And I doubt there are many ex-husbands who will ever be able to say that. I want to believe that everyone who I have been blessed to have had in my life would be proud of me for what I am doing now, that I am talking about having this illness. Praying that this will find its way to others who would need to read what one has gone through with bipolar. Praying that this will help steer others clear of the suffering that I and too many in my life had to experience. I will always be living on the Hell Curve. But I thank God and I thank the many people He has put into my life, that it's not a curve that I have to be graded on. Part 4 of Being Bipolar will be published soon. Have you considered being a public speaker Chris? You should find an agency to represent you and hit the lecture circuit. This is powerful stuff that you are writing! Chris you are a real fighter! It takes a strong person to be open about mental illness and admit a drug addiction. I know you didn't want that but that is still hard for anyone to admit. This was the best chapter so far and I thank you for writing this. God is using you more than you know. Don't forget that. Chris I cried during reading part 1. I cried reading part 2. I cried hardest of all reading this part. My mother had bipolar too. She died two years ago. If someone could have told us what you are telling now I would have understood enough to have helped her and helped myself. I didn't know until it was too late that she wasn't at fault and that she was loving us despite her mental torture. The other day a good friend had me borrow a book from him: "When God Winks At You". It's all about how God *does* communicate with us and even speaks to us. Usually, through what most people call coincidence. The book is chock full of little vignettes about real people who had some amazing things happen (the one of the father who got a "hi, Dad" message... that's all I want to say about it because it's *well* worth discovering for yourself... is an absolutely beautiful story). The reason I mention this is because I got back home from rehearsal for our community theatre guild's production of Gypsy last night, and started reading the book as I unwound for the night. And since last night, there have been two or three "little things" (but really not so little) that have happened to me, that... does feel like maybe God is "winking" at me. I had a severe bipolar depressive episode yesterday afternoon and evening. I was able to get through it much easier than I usually can. That verse you posted, was a huge encouragement to me this morning. After reading your posts on bipolar disorder, all I can say is that you're an amazingly strong person not to be driven crazy by it. What I mean is - you're still alive and stable, even if your brain needs assistance to keep the emotions that way. You've helped my understanding of the disorder and the people who suffer under it immensely. Thank you.